Downloading your Aadhaar can be confusing. Especially when you do it for the first time. But Don’t Worry! In this tutorial, you will know how to download your e Aadhaar card in the right way. You may be wondering “Is it Difficult?” “No.” Just follow me step by step. What is the Password of my Aadhaar Card? There are many ways to Download your Aadhaar Card online. Click the one you prefer from the above Menu. This method will tell you How to do e aadhar card download. 1. Head over to UIDAI official Homepage and Click on “Download Aadhaar” under Get Aadhaar section. 2. Then you will be redirected to E-Aadhar Card download page. 3. Make sure that Aadhaar Number is selected at the top. 4. Enter your 12 Digit Aadhaar Number in the Aadhaar Number field. 5. If you want to download a Masked Aadhar card then click “I want a masked aadhaar?”. If you are confused then read What is Masked Aadhaar and How to Download it. 6. Enter the Captcha for Verification in the captcha verification field. 6. Recheck that all the information is correct. Then click on Send OTP and an OTP will be sent to your registered mobile number that will be valid for 10 Minutes. 7. Enter it in the “Enter OTP” and click on “Download Aadhaar.” Your E-Aadhaar Card will be downloaded. 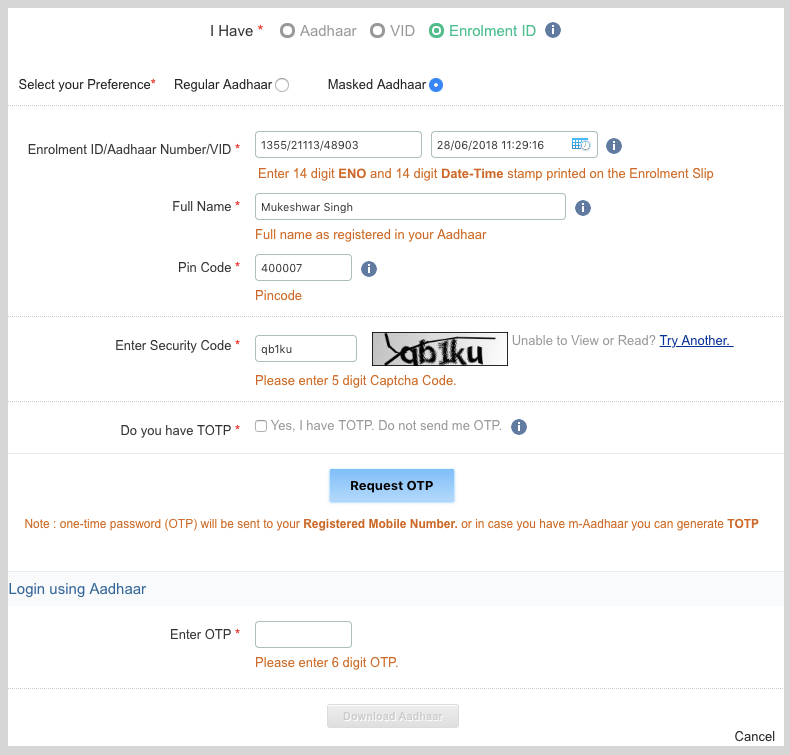 Note – If you don’t want to use OTP, or OTP takes forever to come then, you can use TOTP to Download your Aadhaar Card. Your Downloaded file will not open as it is password protected. To open it Know What is the Password of my Aadhaar Card? By following this easy method you can easily download your aadhar card in 2 minutes. Aadhaar card takes 60-90 days to reach, which means you have to wait a long time. Thankfully you can download your e Aadhar with your Enrollment Slip and use it as your actual card. It is essential that you Check your Aadhar Card Status as you can only download your card if it is generated. Now I guess that you have checked your Aadhar Card Status and it shows Generated. Without further ado, let’s get started. 3. Firstly in the top section in “I Have” ensure that “Enrolment ID” is selected. Which by default is selected. Regular means Simple Aadhaar Card with all information. Masked means that the first 8 Digits of your Aadhar Card will be hidden as ‘X.’ You can read more about Masked Aadhar here. 5. Then in “Enrolment ID” section put your 14 Digits Enrolment ID and 14 Digits Date-Time. You don’t know where to find them? In your Acknowledgement slip, at the upper left section, you will have your 14 digit Enrolment Number. And in parallel right, you will see your Date and Time in DD/MM/YYYY and HH:MM:SS format. Put the Enrolment number and Date-time in their field like the picture above. 6. Fill in the Required Information like your Aadhaar Card Number, Full Name, Pincode of the Registered Area, and the 6 Digit Captcha. Your Information will look something like this. 7. Click on “Request OTP” and then a pop up will appear, select “I Agree.” An OTP will be sent to your registered Mobile Number valid for 10 Minutes. 8. 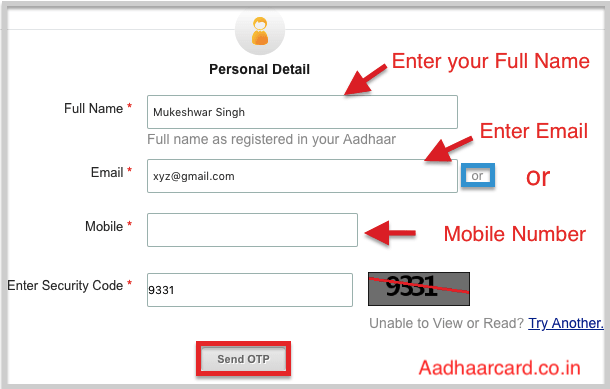 Enter the OTP in “Enter OTP” field and click on “Download Aadhaar.” Your Aadhar Card will be downloaded in a PDF format. If you don’t want to use OTP, or OTP takes forever to come then, you can use TOTP to Download your Aadhaar Card. Your Downloaded file will not open as it is password protected. To open it Know What is the Password of my Aadhaar Card? Do you want to Download your e Aadhar Card but your Enrolment slip is misplaced? Don’t Panic! You can still Download your Aadhaar Card easily. And Don’t worry as you don’t have to visit Enrolment Center again for getting a Duplicate slip. Just Follow me Step by Step. Without Further ado, let’s get started. 2. 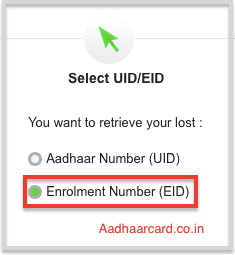 Click on Retrieve Lost or Forgotten EID/UID under Aadhaar Enrolment and you will be redirected to a new page. 3. Select Enrolment Number (EID) from the left side. 4. Enter your Full Name, Email or Mobile Number and Security Code in their Fields. 5. Click on Send OTP and an OTP will be sent to your Registered Mobile Number. 6. Enter your OTP in the Enter OTP Field and click Verify OTP. 7. Your Enrolment ID will be sent to your registered Mobile number and a message will appear saying Congratulation! Your Enrolment ID(EID) is sent to your Mobile. Now you can Download Your Aadhaar Card by Enrolment Number that you just retrieved. Your aadhar card download within 5 minutes. Aadhaar Virtual ID or VID is an alternative to Aadhaar card Number. You can use it when you don’t want to give your Permanent Aadhaar Card Number. If you haven’t generated a VID till now then Know How to Generate A VID. If you have a VID then let’s get started. 2. Click on Download Aadhaar under Get Aadhaar Section which will redirect you to E-Aadhar Card download page. 3. Firstly in the top section in “I Have” ensure that “VID” is selected. As by default “Enrolment ID” is selected. Masked means that the first 8 Digits of your Aadhar Card will be hidden as ‘X.’ If you are want to Know about read What is Masked Aadhar and How you can download it. 5. Fill in the Required Information like your Aadhaar Card Number, Full Name, Pincode of the Registered Area, and the 5 Digit Captcha. 6. Recheck that all the information is correct. Then click on Request OTP and an OTP will be sent to your registered mobile number that will be valid for 10 Minutes. 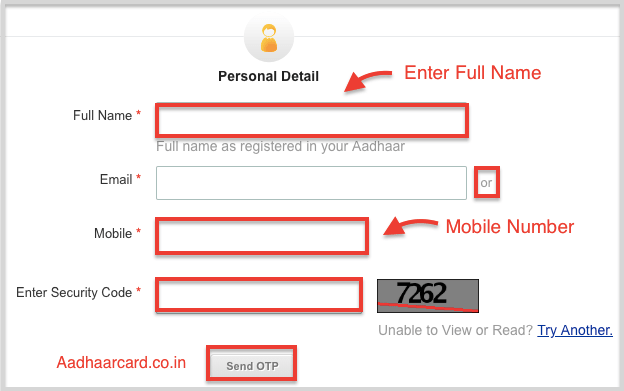 Enter it in the “Enter OTP” field and click on “Download Aadhaar.” Your Aadhaar Card will be downloaded. Lost your Aadhaar Card? Or Maybe Enrollment Slip? No Worries! Here is the solution with which you can download your Aadhar card by name under 2 minutes. 1. 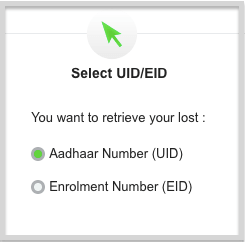 Head over to UIDAI official Homepage and Click on Retrieve Lost or Forgotten EID/UID under Get Aadhaar Section. 2. You will be Redirected to other Page. 3. From the Left side select what you want to Find/Retrieve. 3. In the Middle Section, Enter your Personal Details. 4. If the information is correct then an OTP will be sent to your Registered Mobile Number. 6. Your Aadhaar Card/ Enrolment ID will be sent to your Mobile Number and a message will be shown “Congratulations! Your Aadhaar Number(UID) is sent to your Mobile”. Now you can Download your Aadhaar Card by what you Retrieve. Click on the Method by which you want to Download your Card. Did you try downloading your Aadhaar Card but your Mobile Number is lost? It happened to me too and just like you I searched everywhere for the solution. There are four things you can do to Download your Aadhar Card without otp online. For Downloading with the first three options, you must already have installed and validated the apps on your device beforehand. If any of this App is already not installed and Validated on your device then you cannot download your Card as Validation also need OTP. Remaining with the Fourth Option which is also preferred. Here is how to do it. 1. Go to UIDAI Enrolment Center Search. If it shows you any Enrolment Center then move to Step 4. It will show you all the Nearby Enrolment Centers. 4. Visit the Address given in the Center Summary and Take your Aadhaar Card, Identity Card and 30 Rupees in your Pocket. 5. They will take Biometric Scan, Retina Scan and a Picture for Verification. 6. Your Mobile Number will be updated within 10 Days to 90 Days. P.S. – In my Case, Mobile Number updated in 6 Days. 1. Open mAadhaar App and Select Your Card. 3. Use this TOTP to Download your Aadhaar Card Online. 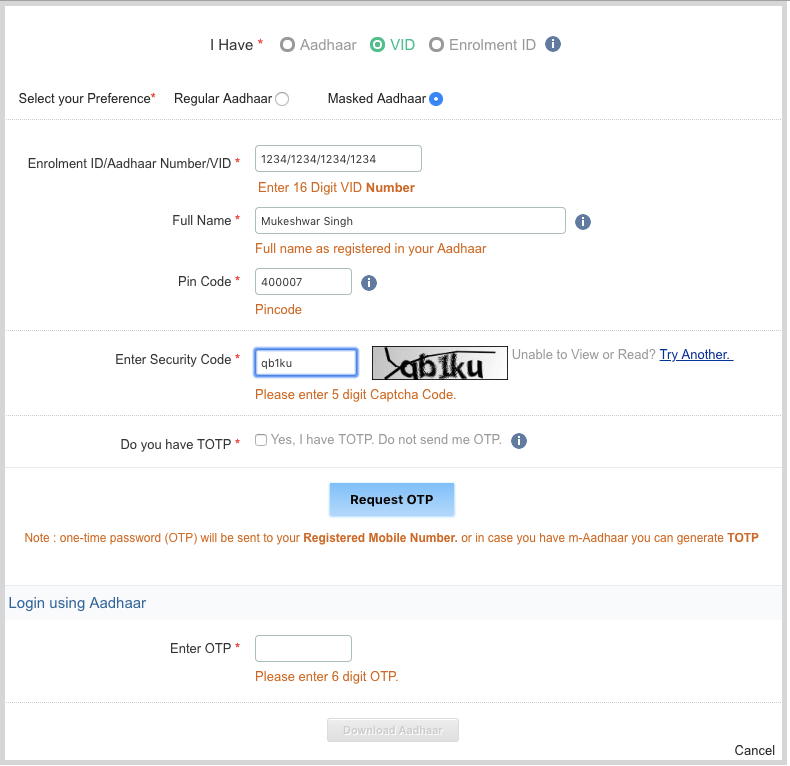 See How to Use TOTP to Download my Aadhaar. 1. Open DigiLocker App/Website in your Device. 3. Your Issued Documents will show like the picture below. 5. Now you Have to Validate your E-Aadhaar Card to use it. Know How to Validate your E – Aadhaar Card? 2. Click on the First Result which says “View & Download Your Aadhaar Card from DigiLocker Account” and it will show you your Aadhaar Card. 3. Click on the Down Arrow in the right side of Aadhaar Card and your card will be Download. 4. Now you Have to Validate Your Adhaar to use it. Know How to Validate your E – Aadhaar Card? 2. Click on that, and you will see a unique 8 digit code. 4. Enter the TOTP in “Enter TOTP” section and click “Download Aadhaar.” Your Card will be downloaded in a PDF. 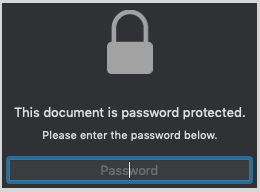 Your Downloaded PDF will be password protected to ensure that only the legit user can open it. But How does a real owner opens it? The password of this PDF is the Combination of the first four Alphabet of your name (In Captial) and Year of Birth. For Example – If your name is Sunita Verma and you were born in 1997 then your Password will be SUNI1997. Q. What if my first name does not have four Alphabets? Ans. If your first name does not have four Alphabets then you can use your surname for required alphabets. For Example – If your name is Ram Sharma and you were born in 1991 then your password is RAMS1999. P.S. – After Opening the file you have to Validate your Aadhaar Card to use it. Q. What if my first name has Dot in it? Ans. If your first name has a Dot in it then you have to include that Dot in your password as well. Q. What if my full name is smaller than 4 Alphabets? Ans. If your full name is smaller than 4 Alphabets then put the given name and your year of birth. For Example – If your name is Ria and you were born in 1995 then your password is RIA1995. Once you open your PDF there will be a question mark near QR Code that says “Signature Not Verified” in Aadhar Card. You have to verify that Signature in order to make your E-Aadhaar Card Verified and Authentic. 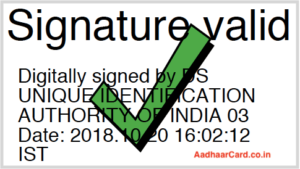 There is a complete Tutorial on How To Validate Digital Signature in Aadhar Card. After the verification, you have to print it and Viola your E – Aadhaar Card is ready. If you have any question or query related to this topic, then comment below we will reply you as soon as possible. You can Print it by opening the file and Pressing CTRL + P in Windows and CMD + P for Mac and choose the desired settings. Q. What is Aadhar Card Download Password? Ans. 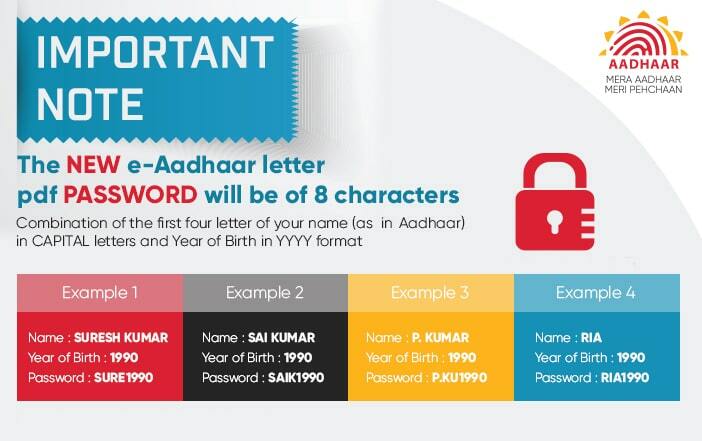 The Password of your Aadhaar Card is the First four Alphabets of your Name(in Capital) and your Date of Birth. Q. How can Aadhar Card Download? / How can Download Aadhar Card online? Q. Can we Download Aadhar Card? Ans. Yes. You can Download Your Aadhaar Card Online which is called E-Aadhaar Card. Q. 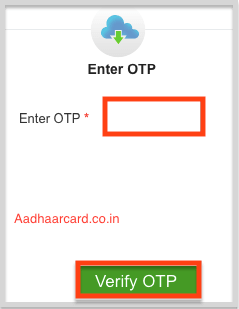 Can we Download Aadhar Card without OTP? Ans. Yes, You can Download Aadhar Card without OTP with the help of TOTP generated by mAadhaar App. Q. How to download Aadhar card from USA? Ans. You can Download your Aadhaar Card by your UID, EID and VID. Well, all you need is access to your registered Mobile number directly or indirectly. Either you have your working Registered Mobile number (which is almost impossible) or Your family living in India have access to your registered Mobile number to Recieve OTP. After that, you can choose any options from below. Q. Can we Download Aadhar Card Online? Ans. Yes, you can Download Your Aadhaar Card Online which is called E-Aadhaar Card. Q. How to download aadhar by qr code? Ans. Well, you cannot Download Aadhaar Card by QR code, but you can download it by UID, EID and VID and in each of the case you will get a QR code. Q. How to download aadhar card acknowledgment slip? Ans. You can not Download your Aadhaar Card acknowledgment but can retrieve the Important information required to Download your Aadhaar Card. Know How to Download Aadhaar Card by Acknowledgement Slip. Q. 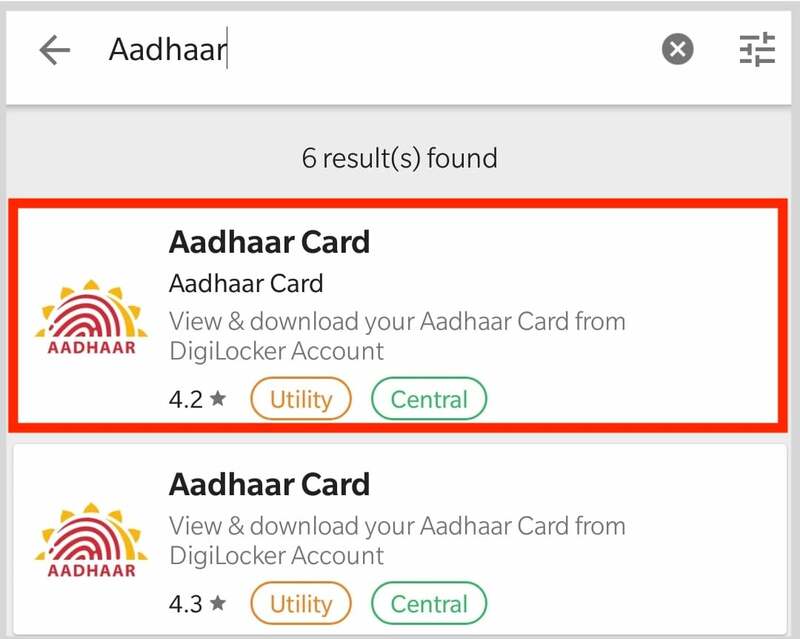 How to download aadhar from digilocker? Ans. 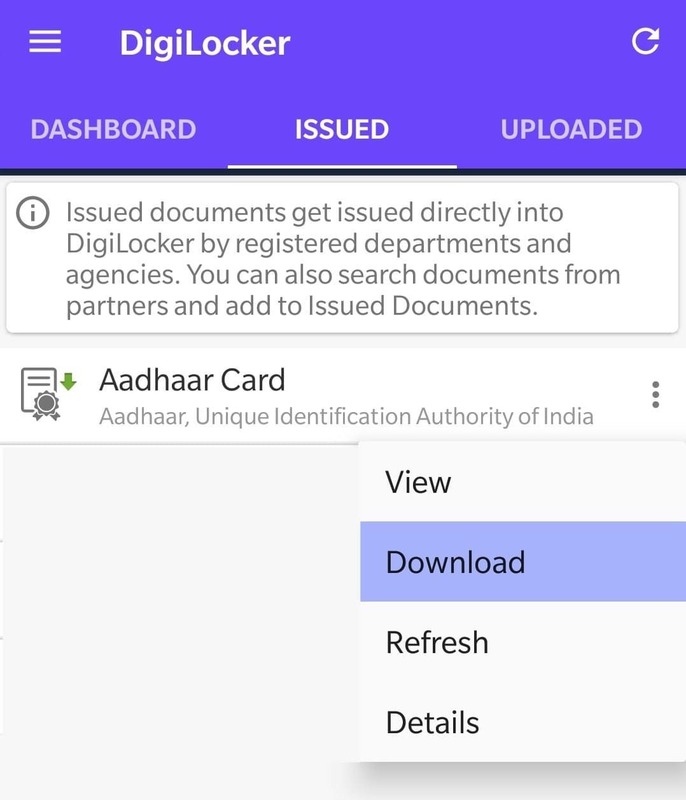 Follow these Steps for Download Aadhar from digilocker easily. Q. how to download aadhar TOTP? Ans. You can use mAadhaar App to show you TOTP which you can use to Download your Aadhaar. Know How to Use TOTP to Download my Aadhaar. Q. Can I Download Aadhar Card By Name? Ans. Yes, you can Download Aadhaar Card By Name. Q. Can I Download Aadhar Card from USA? Ans. Yes, you can Download it from USA as long as you have the access of the Registered Mobile Number or TOTP. Ans. You can Download Aadhaar Card from outside India if you or your Relative have access to your Registered Aadhaar Mobile Number. If you have direct or indirect access to your Mobile number then Know How to Download Aadhaar Card. Q. How to download aadhar card without any details? Ans. You can’t download Aadhaar Card without any details as UIDAI is very strict for the privacy of the user. Q. How to download aadhar card when lost? Ans. You can download your E Aadhaar Card easily. Check How you can Download Aadhaar Card when lost. Q. How Can Download Aadhar Card Youtube? Ans. You can Download Aadhar Card by many Ways, and we have videos for all the methods. Here is the one you can Check Aadhar Card Download by Aadhaar Number Only. Q. Which site to download aadhar card? Ans. You can Download aadhar card from UIDAI a.k.a Unique Identification Authority of India. Q. Who can download aadhar card? Ans. Only the real Owner of Aadhaar Card can download his/her Aadhar card or anybody having all your Aadhar details and access to your mobile number can also download your Adhaar. Q. How to Aadhar Card Download in Mobile? Ans. You can Download Aadhaar in Mobile the same way you do in PC. Q. How to Aadhar Card Download without Enrolment Slip? Ans. You Have to Retrieve Your Enrolment Slip Number to Download your Card. Here is How you can do it – Download Aadhaar Card By Name and Date of Birth. Q. How to download aadhar card in mobile? Ans. You can Download Aadhar card in Mobile the same way you download in your PC/Laptop. Know How to Download your Aadhaar Card. However, you have to transfer the PDF to PC/Laptop for Validation of Digital Signature. Q. How to Aadhar Card Download by Fingerprint? Ans. You Have to Visit Nearby Aadhaar Card Enrolment Center to Download by Fingerprint. Q. How to Aadhar Card Download without Name? Ans. You Have to Retrieve the Aadhaar/Enrolment Number and then Download it. Q. How to Download Duplicate Aadhaar Card? Q. Aadhar Card Download for new Born Baby? Ans. The Download Process of new born baby aadhar card is same as that of Adult, You have to visit UIDAI and follow the same procedure as above. Ans. You Can Download your Aadhaar Card within 2 Minutes if you know How to do it. Ans. You can Download your Sasha Card by Name by first Retrieving your UID/EID number and then Downloading it from UIDAI. Ans. E Sasha Card is Sasha Card Online Version which you can Download from Official UIDAI website. Q. How can download aadhar card without mobile number? Ans. You cannot Download your Aadhaar card Without your Registered Mobile Number as per the latest guidelines of UIDAI. Q. How can i download aadhar without enrollment number? Ans. First, you have to Retrieve your Enrolment Number and then Download your Aadhaar from Enrolment Number. Q. Can NRIs also get Aadhaar? ANS. As per the Aadhaar Act, 2016, only a resident who has resided in India for a period or periods amounting in all to 182 or more in the 12 months immediately preceding the date of application for enrolment. Q. E aadhaar when download asking for password? Ans. E Aadhaar downloaded PDF is password protected to ensure that only the real owner can open it. You can Know the Password of yourAadhaar Card here. Q. Why is e-Aadhaar password protected? Ans. Your E-Aadhaar is password protected to ensure that only the real owner can open the PDF. Suppose if somebody anonymous has access to your PDF then also he cannot open it if he doesn’t know your Name and DOB. Q. How to open e aadhaar download? Ans. You have to put the password of the PDF which you can know in Password of your Aadhaar Card. Q. E aadhaar download from update request no? Ans. Update Request Number is used to check the status of your Aadhaar Update. To download Aadhaar Card you can use Aadhaar Number, Enrolment ID and VID to Download it. Q. Eaadhaar download with urn? Ans. Update Request Number or URN is not used to download Aadhaar Card, instead, it is used in Aadhaar Status. You can download your Adhaar by UID, EID, VID. Q. E aadhaar download but asking for password? Ans. You have to put the Password to open your Aadhar PDF which you can find in What is the Password of my Aadhar Card. Q. E aadhaar download in mobile? Ans. You can download your Aadhar in mobile through mAadhaar App or visiting UIDAI website from Browser.